Air Traffic Controllers (ATCOs) use a range of decision-making tools to support them in their task to manage aircrafts and the airspace efficiently and safely. Although invisible or hidden, Trajectory Predictors are a key functional component in most of these tools. Trajectory Predictors can be integrated into a large variety of third party solutions to improve precision and performance of these solutions. Such as ATFM tools, conflict detection, sequencing tools and simulations of future trajectories for research studies and testing new procedures. Most Trajectory Predictors on the market are limited in accuracy due to the lack of data used to map out the trajectories that will be flown. For example, changes in speed depending on airlines, and altitude affected by actual aircraft weight, weather etc. weather information such as wind, temperature and pressure. commercial operational constraints (such as companies’ internal regulations on speed). 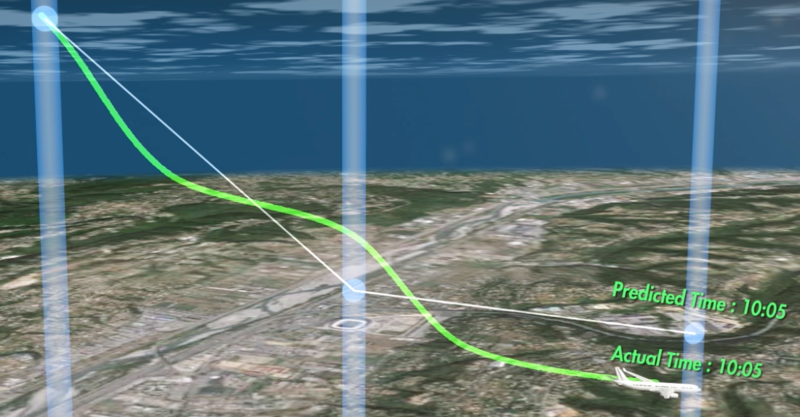 This allows SkyKeeper 4D Live TP Models to predict the path of the aircraft as the onboard Flight Management System (FMS) does. Using Big Data on trajectories we are able to detect behaviors which improve predictability of trajectories. Thus we can garantie that patterns will be followed, enabling SkyKeeper 4D Live TP to increases safety, capacity, and efficiency. SkyKeeper Live TP is able to predict 90 minutes before landing, with an accuracy of 1 minutes (where our competitors offer a precision of 5 minutes within the same conditions) time of arrival at the airport as well as approach merging points.